FoHM's Grant Scehme has been set up to assist musicians, students and groups in the study, performance and promotion of Scottish Traditional Music, Song and Dance. Any member of FoHM resident in the Highland or Western Isles local government areas may apply. Grants may be given towards meeting the cost of specific expenditure related to the advancement of the applicant's knowledge, experience or career prospects in the fields noted above. They may include fees for study courses, course materials and related travel and accommodation costs, purchase of study material and costs of producing recordings. This may also cover costs of mounting specific events, or for taking musicians on tour. Grants will not be awarded for the purchase of instruments or accessory equipment. Support will also not be given for expenditure already incurred prior to the Grant decision. Grants are differentiated between those aged 23 and under, with a maxiumum award given of £500 per annum, and those over 23 years of age, and for Groups, with a maximum award given of £1,500 per annum. Here are some recent Grant awards. Descriptions of projects are contained in the Grant Recipients page. £200 to assist a youngster attend a piping and druming course in Skye. £300 to assist a youg clarsach player attend the Edinburgh Harp Festival. £200 towards master class tuition for a young fiddler. £800 to assist a school ceilidh band's trip to Canada. £590 towards a young duo's CD production. £250 towards a young music group's trip to Orkney. To apply for a grant, applicants must lodge the relevant application form with the Grant Secretary at least two months before the funding is required. If the applicant is under 16, his or her parent or guardian should also sign the form. Applicants musr also read and accept the FoHM Conditions of Grant, download link below. The award of grants is at the sole discretion of the FoHM Committee whose decision is final and it will not enter into any correspondence on the merits of an application. In the event of the project not proceeding or the costs being less than anticipated, the applicant will be bound to repay the grant or such amount as is appropriate and recoverable by the applicant. Successful applicants will be asked to submit a report to the Secretary on completion of the project. In addition, they must use Social Media to promote FoHM wherever possible. The FoHM Logo must be used on any publicity material, CDs etc, and can be downloaded via the Links Page. From time to time, FoHM organises events promoting Scottish Traditional Music, song and dance. Successful applicants who are performers may be asked to make themselves reasonably available to take part without fee. It will be at the discretion of the Committee to publish details of grants awarded. 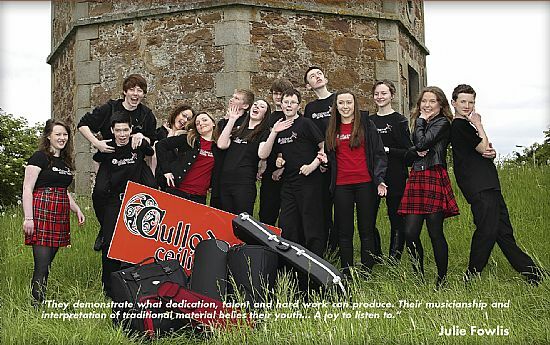 In June 2014 we gave a grant to Culloden Ceilidh Band (below) to assist with their tour of Donegal. Afterwards, each participant wrote to us giving their impressions from the tour. Many made reference to the passion that the local people had for their traditional music and the benefits of experiencing a related but different tradition. 'a memorable experience' 'a fantastic experience' 'an unforgetable experience' 'really inspiring' 'an amazing experience' 'absolutely brilliant' 'an amazing opportunity'. Congratulations to the band members and to leader/ organiser Mrs Alison Mackenzie for such enterprise. Our best wishes go to Alison who has just retired from Head of Music at Culloden Academy.